We’re going to break down everything you need to know about leveling your RV appropriately. First, we’ll discuss the top five leveling blocks and why we’ve made our selection. Everything you need to know about leveling your RV is right here. Why Will A Refrigerator Stop Working If My RV Isn’t Level? No matter where you look, Andersen’s name is floating around somewhere. That’s because they pioneered one of the most advanced systems for leveling your RV, which was quickly mimicked by the competition (even though, to their credit, some of they did a great job). Andersen holds up to 30,000 lbs so long as you remain within the 4” diameter allotment. Ride up to the blocks, roll up, inject the other pieces into place, and you’re ready to go. Andersen includes circular inch measurements so you can know exactly how high off the ground your RV is, making the next time even easier. This is designed for a single person to use it with under five minutes of setup. Stabilizing with cinder blocks and manual jacks are in the past. With this simple system, you get into place, and stay that way. 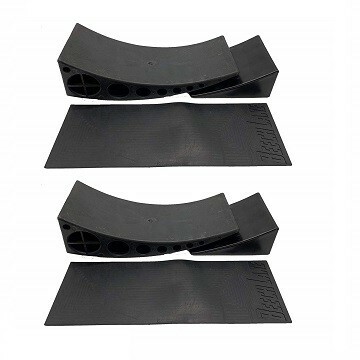 These RV leveling blocks accommodate up to a 32” wheel size as well. Riding on the Andersen design, Beech went ahead with the sliding block ideal. They came very close to mimicking the same take as Andersen, and in some regards, they even had more success. They added a traction pad to this polymer construction, and equipped it to handle an additional 5,000 lbs more than the Andersen model. You’ll notice similarities in the circular measurements along the side, and the simplicity of locking the two pieces together. You’ll be able to set this up single-handedly in about five minutes or less, with a few simple maneuvers. The other way they actually rose above Andersen is with their lifetime warranty. They even vow that if you modify the levelers in a small way, (which most warranties on products would never allow), it’s still under warranty. They want you to be happy with the product above all else. Super simple and lightweight to store in your RV during travel. That’s why Bunkerwall made the list, apart from their original design elements. You get three different ways to level your RV, giving you the option to off-center your axle, should it need it, with two blocks. These only hold a combined weight of 10,000 lbs per axle. Versatility was a big factor. The red components separate from the black, unveiling a way for you to use them with tandem axles. These are super lightweight at just under 10 lbs, and inexpensive enough that getting one set per axle is an option. Just keep in mind that they didn’t peak the top of the list for two reasons: lower weight capacity, but also the lack of UV resistance on the polyethylene construction. Don’t worry; our next product on the docket took care of that last flaw. Camco ranks highly on a lot of products for your RV, and we were surprised to find them lacking where others picked up the pace. They did, however, make these out of UV-resistant ABS plastic. After long exposure to sunlight, plastic can get brittle, but the primer on these blocks prevents that from happening for years. You get ten of these to a stack, allowing you to create small pyramids and effectively hoist your RV up onto them to get the height you want. You’ll be able to stash these in the included zippered storage bag when not in use, keeping them free from harm. The last major point of these is the manufactured bottoms that prevent them from being pushed into the dirt. They fell short on the maximum weight though, because they didn’t even list it anywhere, including the package that arrived when we ordered it. Our speculation on the weight here is from personal testing, and the community documenting their experiences. Last but not least, Tri-Lynx made a system that is very simple to use. Ten blocks to a pack allow you to maneuver multiple wheels to position your RV in a number of ways. Tri-Lynx really blew us away with the highest max weight on the list, a staggering 40,000 lbs of resistance. Tri-Lynx also included a ten-year warranty on every block, giving you absolute certainty that even if they don’t hold up to your expectations, you’ll be justly taken care of for trying their product. After contacting customer support to test the waters, they were more than happy to oblige. Because you can stack these in small pyramids to mount, you can use these in multiple ways. This gives you a little more wiggle room than standard block models, though the bottoms aren’t as equipped for handling soft dirt or mud. Let your trailer rest for ten minutes before deciding that your leveling job is finished. Your RV’s position is far more important than you might think. Not having a level RV can interfere with refrigerator operations, toilet flush function, and your comfort while camping out.If your unit didn’t come with an expensive hydraulic lift, you’re among the majority of folk that take their RV out on the road. Any RVer can lug their fifth wheel to a camping spot, they can drop it anywhere and hook up the RV power cord, but only a true RV master can get that perfect level in a short amount of time. We’ve shown you the top leveling blocks to make your RV trip even easier, but now it’s time to show you why it’s important to level your RV. Some issues are technical, while others may seem arbitrary (depending on your RV style). Just know this: leveling your RV makes for a better time, and shows your prowess at providing your passengers with a good time, from an experienced RVer. Maintain Your Center of Gravity: When you’re used to walking around your home throughout the week, and then you’re on consistently uneven ground, it throws off your center of gravity. This makes you more prone to bumping into things, tripping and knocking your feet/knees on the stairs as you travel up. Don’t confuse the family with an unlevel RV. Better Sleeping: We sleep laying flat. Well, at least when we’re at home we do. It should be the same when you’re out on the road. If you have little ones sleeping in the bunk beds in the back of the RV, this benefit also rolls into their center of gravity. You don’t want anyone rolling off and hitting the floor in the middle of the night just because the RV isn’t level. Reduced Storage Issues: We know you have everything secured, but that doesn’t change the fact that opening your cabinets or drawers can lead to them sliding open fast, or items ejecting if your RV isn’t level. They can still get tossed around in the cabinet while you’re driving. When your RV is level, so are your belongings. Your refrigerator uses a very specific coolant that needs to settle. If you’ve ever read up on buying a deep freezer or ordering a refrigerator offline, you’ll notice that it comes with information requesting that you don’t plug anything in until it has been set on level ground for at least 24 hours. That’s because turning it on too soon can damage your refrigerator’s motor, all because the coolant hasn’t set. It’s the same with your RV. If you spend the entire night with an unlevel RV and go to turn the fridge on, you could damage your unit. If you filled up before heading to the campground and your fridge has been running throughout the entire ride, spending the night on unlevel ground is only going to damage it. While that sounds a bit daunting, do note that a few degrees off-kilter will not ruin your fridge. We’re not trying to startle you, it mostly applies to severe tils at about 7 to 10 degrees or higher. If your RV is off-kilter by this much, you’ll be able to tell while walking through it. Manual leveling blocks are the way to go. We’re not personally fans of using X-chocks, which are additional stabilization systems. They help the wheels stay in place, but offer increased risks when trying to set them up. At Kempoo we’re always after the safest (and quickest) way to handle RV setup and maintenance. With manual blocks, you’re getting the full-fledged power of the maximum weight capacity without taking variables into account. Most RV leveling blocks come with far more weight hold than necessary. When you take into account that the average RV is under 6,000 lbs, and the standard RV leveling block can hold upwards of 30,000 lbs, you have a solution staring back at you. You can use cinder blocks, you can use pressure-treated wood, but it’s not recommended. Whether it’s just you setting up the RV or you have another set of hands with you, there’s always danger in doing these things. Your best bet is using something that’s been industry-tested to withstand pressure and massive weight. Don’t get us wrong, there are plenty of folks who have made extremely effective RV leveling blocks themselves. However, most of these gentleman come with plenty of experience in carpentry or woodworking, and understand the engineering that goes into making these. DIY blocks are poised to fail far before a purchased, manufactured leveling block will. If your DIY leveling blocks break, you have to purchase the goods to make new ones. On average, that can cost as much or a little more than an RV leveling block from a trusted manufacturer, not to mention the time spent. We have known some RVers who make their own leveling blocks, but still purchase a backup set of manufactured blocks in case they needed to use them. We wanted to explain the proper way to set up your RV with its leveling blocks. Once you run through this process once, it will become muscle memory. Every time after the first will get easier to get the perfect level on your RV. Pick your spot appropriately. If you rent a spot at the same RV park every single year, you’ll have a good working knowledge of its layout. Don’t be afraid to get out of your RV and walk across a patch where you might be dropping anchor for a few days. The more level the ground is to start with, the simpler your job will be. If it’s a recurring spot, use a shovel to level out the ground before returning next time. Be sure to turn off the engine, and don’t forget to set your parking brake. Consider your rooftop solar panels. If you’re trying to grab a bit of energy from Mother Nature, we can respect that. It just has to be done the right way. Position your panels appropriately before leaving to go the spot, so they’ll still be absorbing the maximum amount of energy after you level your RV. We’ve covered a guide on proper RV jacks. Using the right jack, position your RV to give you a good starting point. If you can back up your fifth wheel to the right spot, get out and inspect the unit. 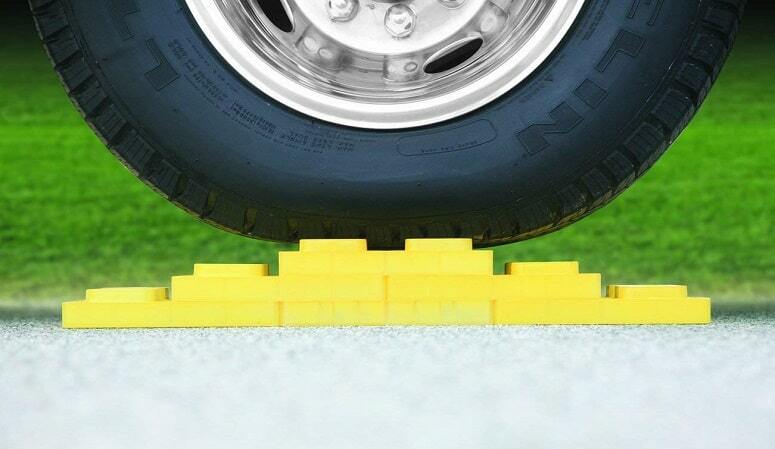 Level it with your jack, and then move your RV leveling blocks into place accordingly. This is the most effective method as ther jack will do most of the work for you. You’ll only really run into problems if one entire side of the RV is leaning (if you accidentally parked on a slight incline without noticing first). Position your blocks into place and unhitch your trailer. You’ll have to consult the exact system you found on this list, and move the block(s) into place following the instructions. If you’re using an automatic jack, you should be able to set up shop without requiring a second set of hands to help you out. They seem like a simple object, but there’s always more than meets the eye. We’ve gone over the main things you should keep in mind when purchasing. We can all get flustered when we’ve gone through numerous Amazon pages and read a ton of information. Review these simple steps below to get in the right headspace, and purchase an RV leveling block you can use for years to come. This will determine if it’s even going to fit your vehicle. 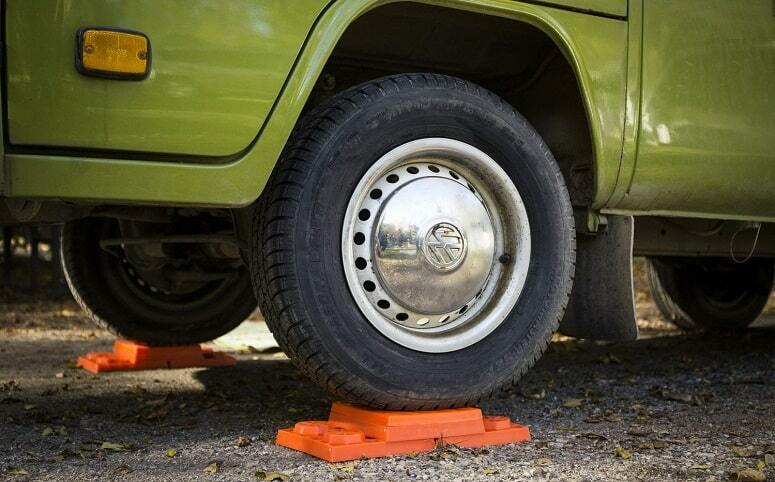 We’ve heard of other RVers buying slightly smaller wheel frame leveling blocks, figuring they’ll be able to wedge it under the tire. Same goes for oversized blocks that are too big for your tires. Don’t go with what’s cheapest, go with what’s right for your RV wheel size, or you’ll essentially be wasting your money. 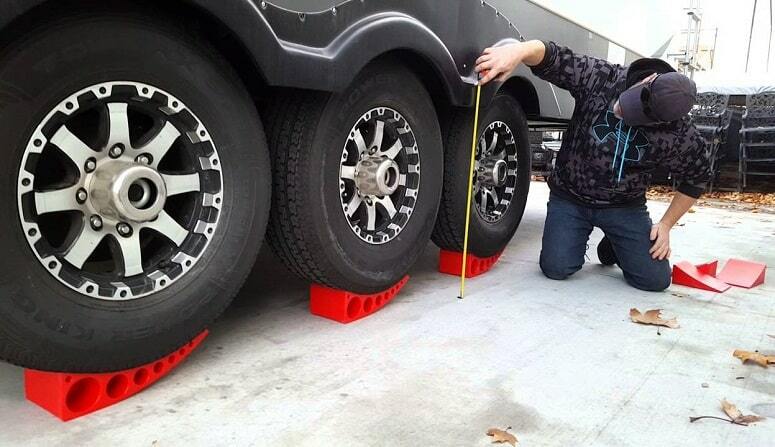 There are only so many RV wheel sizes, and there are definitely leveling blocks available to accommodate your RV. This is going to define durability and dictate your use. So long as the material (usually steel or ABS plastic) can hold your RV, you should be good to go. Manufacturers have to measure to to certain standards, not just for competing with their rival companies, but to ensure they’re selling safe products. If you’re camping with passengers, just account for the total weight of everybody, plus 50 lbs for luggage and belongings. Plan ahead to stay under 80% of the total leveling block weight capacity. Are you usually spending nights in a campground? Sometimes we just have to drop the hitch and relax wherever we’re at, but if you can plan ahead, you’ll have a more enjoyable experience in your RV. Regularly camping on dirt or other non-level spots come with their challenges, so look for an RV leveling block that contours to your usual sites. You’ll have to take into consideration the associated materials, overall weight of your RV, and how much the RV leveling block is rated to hold. In most scenarios, we recommend not exceeding 80% of your RV leveling block maximum load capacity. If you can stay at under 80% utilization of the max weight, your leveling block will last for three years longer on average. Between time, stress and the pressure of your RV, these blocks slowly meld and bend. If you level your RV for five or more days at a time (full-timer with frequent stops), you’re putting even more damage into the block. That’s okay. 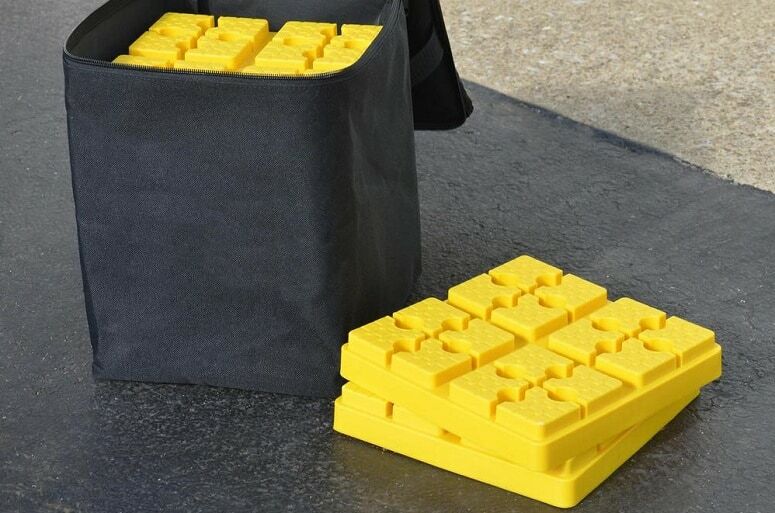 They’re inexpensive and designed to handle this, but we still need to keep an eye on how durable our RV leveling blocks are, and what we’re putting them through. If you’re currently using a DIY leveling block, it’s an option you can go with, but it’s not recommended. We’ve shown you the top five leveling blocks and explained everything that comes into play when using them. It’s time to enjoy your trips instead of fiddling around with the challenges of an unlevel RV.